I don't know where to begin but it just clicked my to search for this pschyic advisor thing after watching a movie today I had a feeling was worth watching .. intuitively. I am terrified from within somewhere I can't sleep at nights only once it's morning 5-5:30 I find peace to sleep ... I have noticed if I sleep at 10...I wake up at 1or 2 and can't sleep till 5 again....I feel like defending myself and being on constant alert mode...though I know my light will protect me but I am not able to make it stronger and become fearless , I feel outnumbered and out strengthened. I do meditation ...weird things happen I freeze for a moment to see weird ways of dimension working up my head ...shadows or perceived images ,,I am scared to meditate. I don't know what to do and it's taking out my strength and influences my loved ones to stay from me....I become difficulty for them. Plus I feel there is a voice in my head that answers to my questions , questions I wonder about ....I feel like I am stuck ...I am curious and needy in someway. I want to discover my potential ...but I am not able to blossom and grow. I am an empath....and very sensitive to energies ...which guide my to susceptible future of one's life ....(I feel I do )...I am so confused. It's something with the temperature of my body too...I find it awkwardly high ...and focusing makes me hungry too....please help me understand ,or clarify if I am the one acting stupid .. Sounds very distressing for you, do you have any thoughts on what may be happening, have any ideas crossed your mind, do you feel you know what might be causing or has triggered some of this off? You say you struggle to sleep, do you know why this might be? It sounds like your body clock may be off balance (would explain the cycles of sleeping at 5 each morning and waking at the same time each morning, sounds like a normal circadian rhythm which is just off balance with the time you waking and falling asleep, it can be helped, though it sounds like something is keeping you awake. Is it your thoughts keeping you awake, something in particular worrying you? You say your body intelligence is not coping with your spiritual experience, how do you mean? 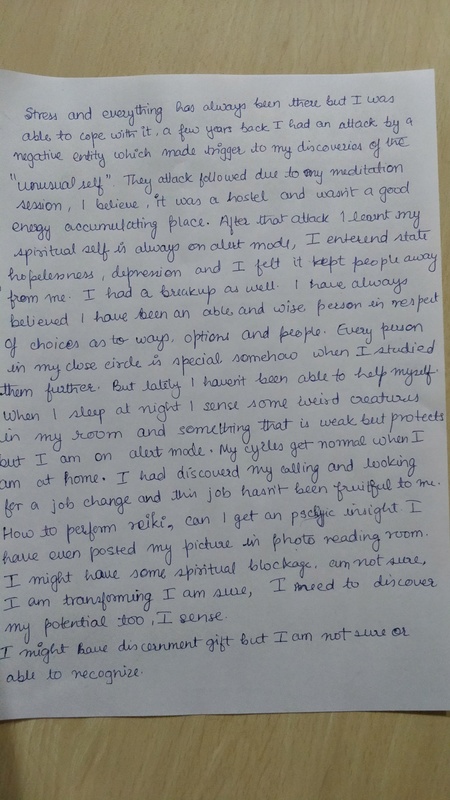 Its not normal , when I go to my home I sleep and work normally ,but when I move to this city where I work ....my past experience haven't been quite good, i am not experiencing anything that's normal and I feel I don't know how to protect myself to highest potential. Is any of the stress coming from people around you? do you find your job or home life stressful? What have you tried so far? what has not worked? Do you meditate, do you have any friends you can confide in? I am scared to Meditate due to history I posted in the images ,and yes I do have friends who support me and believe me And I may be able to confide in them ...depending on situations...and their state. Welcome to Mystic Sisterhood Lostsoul. Keep strength, you are much more deserving than you are giving yourself credit for. But my questions are not answered yet ..